The president of Afghanistan has visited Uzbekistan on a mission to plug his struggling nation into a region from which it has long been isolated, despite the tantalizing proximity. President Ashraf Ghani traveled to Uzbekistan, for the first time since coming to power in 2014, at the invitation of his Uzbek counterpart, Shavkat Mirziyoyev. Among the measurable outcomes to the visit were $500 million worth of export deals. Uzbekistan intends to send electricity to its power-hungry neighbor, as well as agricultural and pharmaceutical goods, building materials and transportation equipment. Mirziyoyev said on November 5 that Uzbek specialists are set to begin a project building a power line from the village of Surkhan in Uzbekistan’s Kashkadarya region to Pol-e-Khomri, a town in Afghanistan just south of Kunduz. There is also an agreement in place on completing railway line from the city of Mazar-i-Sharif, just south of the Uzbek border, through the towns of Sheberghan and Maymana to Herat in the west of Afghanistan. The Uzbek leader referred to the latter as “a historic decision.” Ghani, meanwhile, delighted his guests by peppering his remarks with phrases in Uzbek. The appearance of this railway route taken in the broader perspective not only provides Afghanistan with more infrastructure integrating it into the region to its north, but will also offer Uzbekistan the prospect of a fresh transportation outlet to the Persian Gulf, via the Afghan-Iranian railway links now in development. Ghani’s visit was prefaced by another landmark development on November 29, when a Kam Air plane completed a flight from Kabul to Tashkent, setting the stage for the first regular scheduled flight between the cities in 25 years. The airline is set to have two flights weekly between the capitals. Officials in Afghanistan have said that they hope the route will give their citizens an additional option in traveling to Europe and the United States. “We are trying to increase the transit ways for our passengers. Ahead of this, we were reliant on Turkey and United Arab Emirates, but now passengers can travel to the world through Uzbekistan,” Mahmoud Shah Habibi, head of Afghanistan’s Civil Aviation Authority, was cited as saying by TOLO News. In a further indication of growing dialogue between these generally wary neighbor nations, Afghanistan has expressed interest in opening a consulate in Termez, which lies astride the 137-kilometer border. But all talk of economic deals and prospects are worth little without considering the security angle, which also weighs heavily in dealings between Central Asian states and Afghanistan. Among the more than a dozen documents signed by Ghani and Mirziyoyev was one to create a joint commission on regional security. “The commission will be empowered to give recommendations and proposals on questions of regional security to the heads of state of both countries,” Mirziyoyev said. Mirziyoyev began talking about the need to bolster ties with Afghanistan even when he was still just acting president, in October 2016. 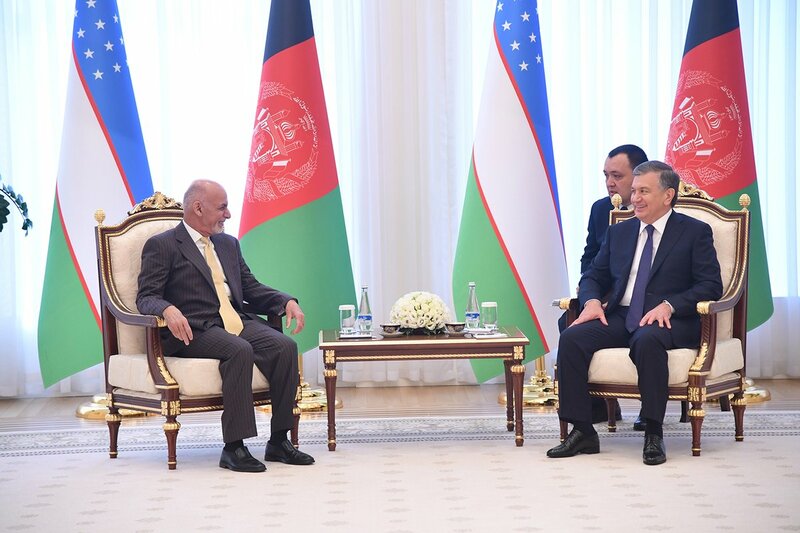 Mirziyoyev said during an inspection of the border at the time that when he spoke of the need to enhance relations with Uzbekistan’s neighbors, he also had Afghanistan in mind. In January, Uzbekistan and Afghanistan signed a trade and economic roadmap, whose implementation they forecast would ramp trade turnover to $1.5 billion dollars “in the nearest future.” And in May, Mirziyoyev created a new post of special presidential envoy to Afghanistan and appointed veteran diplomat Ismatilla Ergashev to the job. Abdukadir Navoi, a representative of the Afghan diaspora in Tashkent, said he was overjoyed at this turn of events. “The Afghan diaspora in Tashkent is around 1,000 people. I deal in exporting Uzbek grain and flour to Afghanistan. The Afghan diaspora welcome the initiatives of Uzbekistan and we hope that all the obstacles between our nations will be lifted. Without Uzbekistan, it is difficult to think of development in Afghanistan’s economy, because a large part of the raw material and goods necessary for our economy come to us through Afghanistan. This means that around 70 percent of imports into Afghanistan arrive through Khairaton on the Uzbek-Afghan border,” Navoi told EurasiaNet.org.